When you think of climate change, it’s natural to think of melting glaciers. Perhaps you also think of intensifying disasters like droughts, wildfires and hurricanes. Certainly, these effects of climate change have real consequences for our communities, California and beyond. However, what’s often lost in today’s debate is climate change’s impacts on our most environmentally-burdened, low-income communities. Just as low income communities and communities of color experience disproportionate levels of pollution, these same communities are particularly vulnerable to climate change. To put it bluntly, lower-income residents are more likely to live in dilapidated and toxic housing stock, have little to no access to parks, recreational and green space and have substandard or far-flung resources. Under the best conditions, such places pose significant challenges for residents. Add on increasingly extreme weather events like exceptional heatwaves or precipitation deluges, the urban heat island effect, lack of shade or weatherization and toxic air emissions, and these communities can quickly become unlivable. 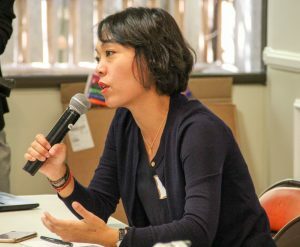 It’s this daily reality that fuels the work of the California Climate Equity Coalition (CCEC), a longstanding partnership between Asian Pacific Environmental Network, the Greenlining Institute, Public Advocates, Strategic Concepts in Organizing & Policy Education (SCOPE) and the Coalition for Clean Air. CCEC’s goal is to work with the California state government to ensure that a substantial portion of revenues from the state’s cap-and-trade program are invested in disadvantaged communities. Not only do these investments have to reduce greenhouse gas emissions, but they also need to create additional health, economic and other benefits for the community. While this effort goes back to at least 2009, CCEC was instrumental in SB 535’s (de León) passage in 2012, and subsequently AB 1550’s (Gomez) in 2016. However, CCEC’s work isn’t limited to the State Capitol and the agencies implementing California’s climate policies. In addition to our advocacy work, CCEC also hosts annual Convenings. 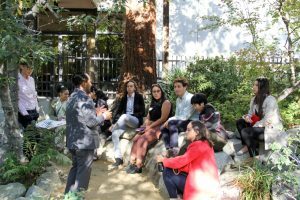 These Convenings are intended to create a space for community members, advocates, state agencies and elected officials to share experiences, ideas and needs with the purpose of connecting communities to Climate Investments and affecting California’s policy. 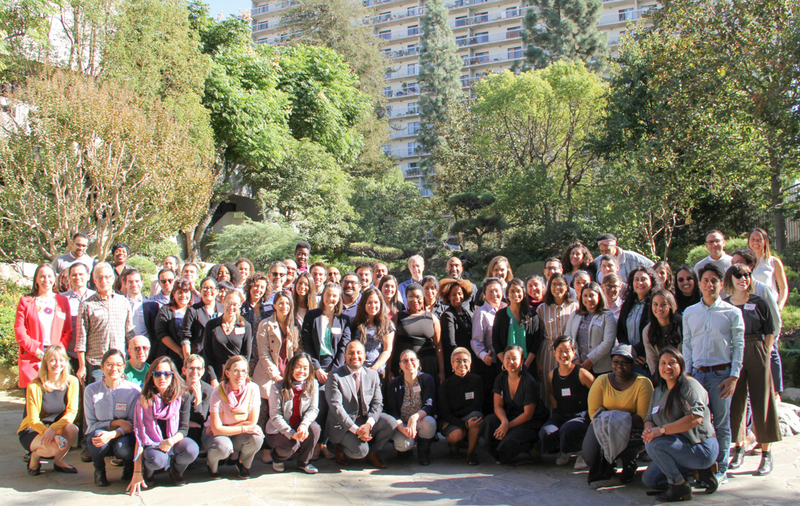 This year’s Convening, which took place in Los Angeles on November 14th and had over 100 participants, was focused on how Climate Investments can create a “Just Transition”. Build the New – Use local businesses, workers and resources to build and maintain and take ownership of community investments. Already, California’s Climate Investment policies are transforming communities. In total, $2.2 billion in Climate Investments have been allocated so far. Implemented Investments will, over time, reduce greenhouse gas emissions by 23 million metric tons, as well as reduce criteria and toxic air pollutants by at least 5,000 tons. Additionally, Colleen Callahan of the UCLA Luskin Center for Innovation noted during the Convening the first $2.2 billion of climate investments have directly created 20,000 blue- and white-collar jobs. When matching funds from other sources are included, the jobs number increases to 50,000. Considering that 51% of investments (just over $1 billion) had benefits for disadvantaged communities, and 31% of investments ($615 million) were invested directly in those communities, many of these benefits will be felt in our most polluted and vulnerable neighborhoods. 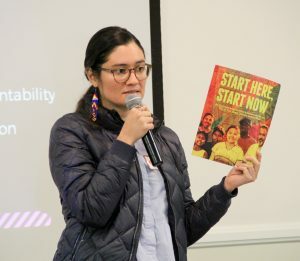 CCEC chose the Just Transition framework as its focus for this Convening because, in many ways, it reflects the next phase of the march for environmental justice. Our policy and regulatory victories in Sacramento need to result in meaningful changes in our communities. 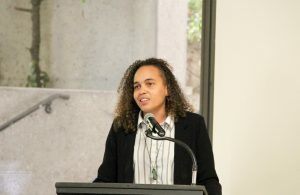 As the Convening’s keynote speaker, Participatory Budgeting Project Executive Director Shari Davis said “I’m about building engaging & healthy communities as well as a breeding ground for leaders who have brilliant ideas to collaborate with for a brighter future.” This approach, one that empowers and improves our most polluted communities, should be the defining spirit of California’s Climate Investment programs. This entry was posted in Clean Air, Climate Equity and tagged #JusttransitionCA, CCEC, Climate change, climate equity, Just transition. I lived in Wilmington, CA for 5 years. I recently moved from that toxic, dirty, smelly, oil, refinery city and have developed a strange rash ever since I left. Black stuff would rinse from my hair when I washed it and I had to scrub my skin in the shower to also rinse toxic fumes from my skin. I think this is an aftermath from residing there and have it on my back, chest, stomach, arms, and legs. I went to the hospital emergency room because the itching became intense. Doctor gave me 3 EX’s and its not gone. Now I’m taking benedral and putting calamine lotion on and its been a month and still not going away. My animals are suffering as well. Licking all day and night, my cat is trying to clean toxic chemicals from their fur and little clumps of oil like balls are forming causing their hair to knot with harden oil between there paws.